Article "Dr. Gertrude Beggs Discusses China"
The article discusses Professor Beggs visit to China where she identified that Chinese-American schools compare favorably with schools in the US. She further stated that the professors teaching at these schools were graduates of some of the best colleges and universities in the world. 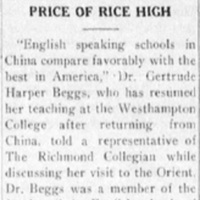 “Article "Dr. Gertrude Beggs Discusses China",” Race & Racism at the University of Richmond, accessed April 18, 2019, https://memory.richmond.edu/items/show/1814.